Who doesn’t love playing games?! This last post for parents on how to support your children in building number sense is all about games. So far, we’ve explored how math is all around us and how we can think mathematically while reading, baking, out in nature or anywhere (shapes are all around us!). We also looked at some websites and how to engage in math discussions for the whole family. Last post I wrote a bit about strategies and why they are so important. This post will extend this a bit to incorporate more games. Fluency is key and kids need plenty of practice to become fluent. Last post I cautioned against using worksheets and flashcards as the ‘go to’ way to improve fluency. 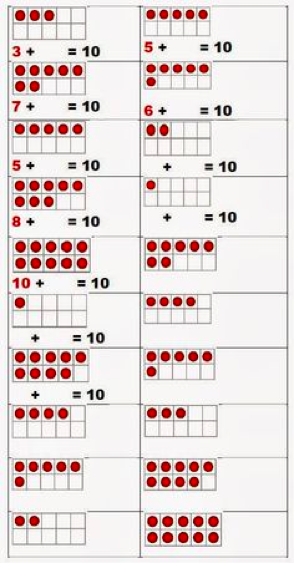 They simply don’t work for most (they may work for memorizing but NOT for developing strong number sense and although memorizing isn’t a bad thing, students need to do more than merely memorize; they need to understand the operations and numbers!). So what can you do instead? Play! Here are some games and activities that can be done at home, with minimal equipment. Spend 10-15 minutes a day on these and your child will make huge gains in their number sense and fluency. I am going to start with more primary games and then move forward to more difficult concepts. That doesn’t mean that kids in grades 6 or 7 won’t need the first few games – many don’t know their “friends of 10”, in which case, this is where we need to start. Learning math is like building a house; there needs to be a strong foundation before we start building walls and ceilings or else it will all crumble down eventually (hitting the ‘math wall’ in grade 10 or 11). When I used to tutor, this is what I spent a good chunk of my time doing: playing games, but with the hidden agenda of building number sense and fluency. If you think about it, it is goofy to ask kids to add double digit or triple digit numbers by stacking them (thus reducing them to digits, not numbers) if they don’t even understand what these numbers mean. I don’t expect many people to have math manipulatives at home (although HIGHLY recommend it), but luckily there are some free virtual manipulatives that you can use. If you are interested in buying manipulatives for the home, these are the ones that I recommend in order of importance: base 10 blocks, Cuisenaire Rods, Fraction Circles (these can be made at home using paper plates!). However, you don’t need to buy anything – you can print off some 10 frames and use buttons, dried beans, blocks, or any other objects you have handy. These can also be used for multiplication. No need for fancy store-bought manipulatives (especially if you use the virtual manipulatives). This handout explains how to play: Make 10 Go Fish, What’s Missing, Make 7 (or 9, 10, 13, etc.) and Memory. Shut the box – this game comes as a board game but you can make your own as described in this youtube video. It’s a wonderful game for understanding how numbers can be broken apart and involves some great strategy and probability! 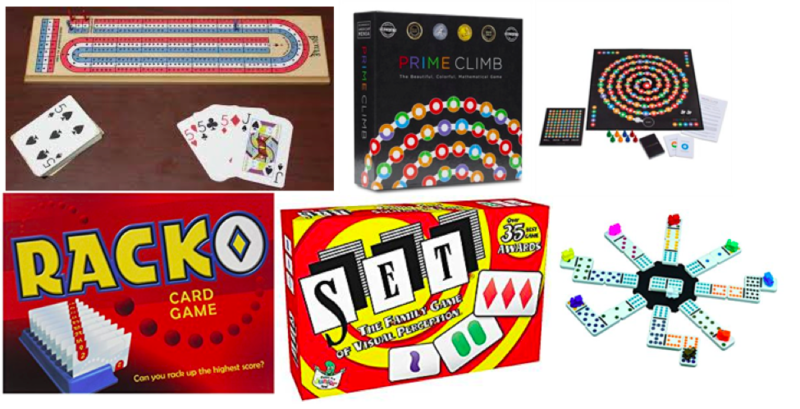 Dice/Card Games for Adding, Subtracting, Multiplication, Division: If you have playing cards you can remove the face cards and use these or you can use two dice. 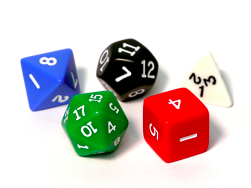 I (and kids) love different sided dice, like 10-sided, 12-sided or even 30-sided dice. Each player rolls the dice (or flips the cards) and adds (or subtracts, multiplies, divides) the numbers. Then roll a regular die and if it is an ODD number then the person with the LOW scored wins a point and if the die is EVEN then the person with the HIGH score wins a point. The first person to 10 points wins. In the event of a tie, both re-roll and that winner gets TWO points for that round. For really young kids, just play that the high score wins to make it simpler. As you’re playing, ask them how they are solving and this is a good chance to try out the strategies and talk about different ways. Kids have such fun doing this and they are really just practicing their facts! 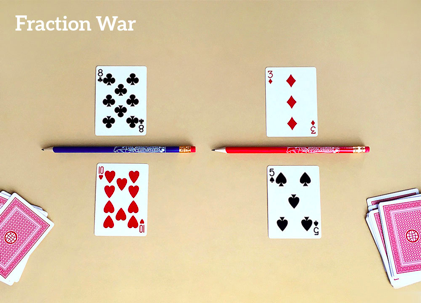 Fraction War: Use a deck of cards. There are two versions of this game depending on the age and skill level of the child. The beginner version is all face cards are 10 and the more advanced version is to make the Jack =11, Queen =12, and King = 13. Divide the pack of cards in half and give each player half of the deck. Both players flip TWO cards and make a proper fraction (less than 1). Compare the fractions by first benchmarking (estimating) to 0, ½ , 1 (if one player has a fraction close to 1 and the other has a fraction less than half, you already know which is larger). If they are both close to 1, then use knowledge of piece size and number to determine which is larger. This game can be played without using a common denominator (although this is helpful when they are very close together) most of the time. Common numerators are also handy and sometimes easier. We know that when the denominator is larger, the piece is smaller (because you have to break the whole into more pieces). This game is amazing for building fraction number sense and kids love it! If there is a tie (equivalent fraction) then both players flip over two more cards and this winner gets all 8 cards. The person with the most cards at the end wins the game. Integer Game: use a deck of cards with the RED = NEGATIVE and the BLACK = POSITIVE. Each player gets half a deck of cards and one player is ‘negative’ while the other is ‘positive’. 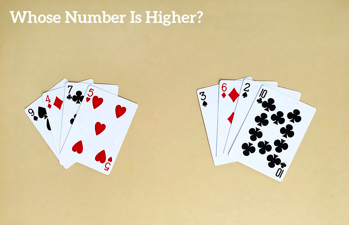 Both players flip one card and add (subtract, multiply) their cards. If the result is positive, then ‘positive’ gets the cards and if the result is negative, then the ‘negative’ person gets the cards. You can either remove the face cards or use Jack =11, Queen =12, and King = 13. Greg Tang (http://gregtangmath.com/games)I love this site! There are so many games. I especially love the break-apart game but all are useful. KenKen (http://www.kenkenpuzzle.com/#) – these are great puzzles to develop fluency and for fact practice. As I’ve mentioned many times before, these are best done with some discussion around strategies. I need to note here that although there are SO MANY math games online, most are not great, which is why I haven’t recommended many. Most are focused on speed which, research shows, are detrimental to many kids and many games are usually just for memorizing. If you can disable the timing and have the opportunity to talk to your child about what facts they are struggling with and what strategies they are using, this is the best way to use these sites, if at all. There are some good sites being developed but they are not free. I’ve not tested them yet, but I’ve heard Motion Math is particularly good. There is a free app that I like, it is locally developed and called ‘MathTappers’. It has visuals so is better than rote memorizing and has basic facts practice and fractions! 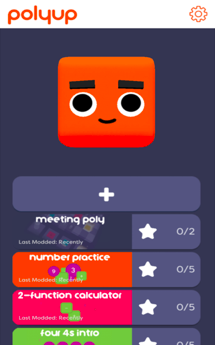 Polyup is another free app that is great for number sense but suitable for older students (grades 6 and up). 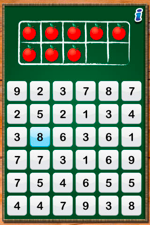 Dragon Box is also fantastic but not free (it teaches algebra visually). If you have other games that you’ve been using please comment with your suggestions! Hitting the ‘math wall’ is when a student who has not developed conceptual understanding and has only memorized math facts finally starts to really struggle and often fails to achieve success in their grade 10 or 11 math courses. It usually ends with the student forever swearing off math and any careers that require math. You may have had this exact same experience! Next PostNext How Do I Teach Conceptually AND Cover the Curriculum?